The scary video played on a loop for about 30 minutes as the bus pulled out of Lanzhou, as we headed up to Xiahe, home to one of the biggest and most important Tibetan monasteries in China – Labrang, which clings to the edge of the Qinghai-Tibet plateau, just before it starts its plunge to meet the dry deserts of Gansu Province. 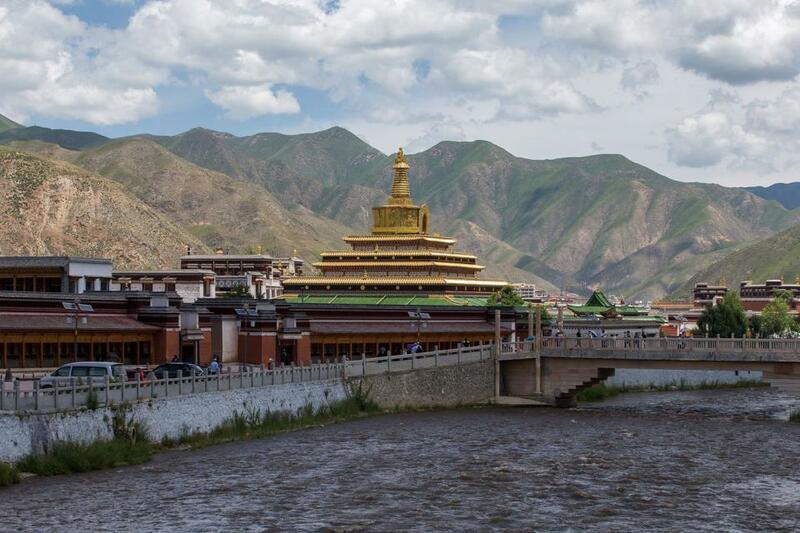 The last time I’d journeyed up to Xiahe, in 2001, the journey was fraught with danger, as the rickety bus zoomed round hairpin bends, climbing past towns with mosques and minarets in Chinese style. The toilet stop is best left undescribed. Now, everyone had a ticket for a numbered seat, there was no loud music, no one smoked, the new highway whisked us up there in just three hours – and the toilets were clean at the rest stop. More importantly, everyone wore their seatbelt, basically scared into submission by the astonishingly graphic video footage of non-seatbelt-wearing bus passengers being thrown through windows to meet a presumably sticky end. Arriving at the town was different too. Back then, there was really only one street; the town split between ethnic Hui muslims, Tibetans and Han Chinese, one stretch of street turning from one style and one cuisine to the other, before ending up at Labrang Monastery, squeezed in by hills and the Daxia River, a tributary of the Yellow River. Now the town is undergoing a considerable spruce-up – it is bidding for UNESCO World Heritage status, and workers were rushing to finish repaving all the streets ahead of the winter cold. This meant the main road, where many of the shops and restaurants of interest to tourists and pilgrims are, was a big construction site. Still, there was the sight of nomads solemnly herding their dzos (a yak-cow hybrid) amid the chaos, unperturbed by the heavy machinery and drilling. The main event in Xiahe is obviously Labrang Monastery, one of the six most important in the Yellow Hat sect of Tibetan Buddhism. Still a major site of pilgrimage for Tibetans, there are currently some 1,200 monks living and studying there, although there are often more visiting. It is still considered a great honor for a family if their child enters Labrang to train as a monk. Past Labrang itself, there is a smaller Red Hat sect monastery and a nunnery. 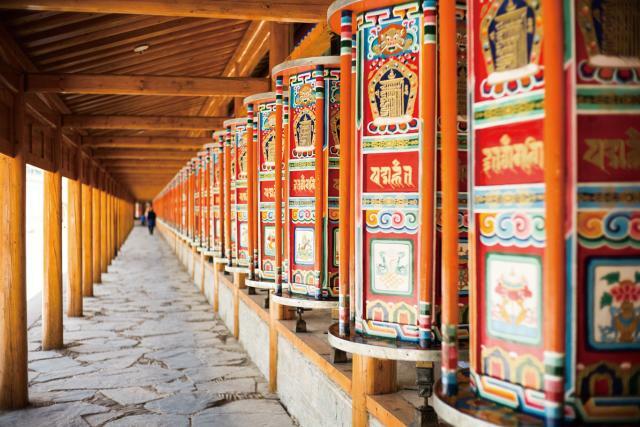 The best way to get an idea of the scale of the monastery, which has existed since 1709, and the devotion pilgrims pay it, is to join them in a kora – a walk around the outside, where you can push prayer wheels (clockwise) as you go. The small kora, right around the monastery itself, is quite busy, and particularly so at sunrise – peak time for prayers and pilgrims. It’s a jolly affair – the more serious adherents are tackling the kora on their hands and knees, but most people are just out for the day, often with family, and seem to use it as an excuse to catch up on the gossip. When you reach a small temple, walk around clockwise three times. Do not walk anti-clockwise around anything – I’m not sure what would happen, but I think it would cause an upset. I chatted with a lady who was up from a nearby town for the day with her grandson; other people had come from further afield. The small kora is only around three kilometers, but you can also try the big kora – a steep walk up the hill behind the nunnery affords great views over the golden roofs of the prayer halls and other buildings, and will take around 1.5 hours. To tour the monastery, there are monk-led English language tours in the morning and afternoon, but more frequent tours in Chinese. Instead of the convenient ticket office close to the entrance, now you have to start in town at what is probably the largest, emptiest ticket office I have ever seen. Then you have to walk back to the monastery. I’m told it’s busier in the summer. The monk will whisk you around some of the main halls – to see yak butter sculptures, the only place you are allowed to take photos, and to other places like the hall of astrology or medicine. Over all hangs the pervasive smell of yak butter candles, and the mesmerizing sounds of chanting at prayer time. When I visited, we were lucky to bump into one of the (two) foreign residents of Xiahe, a Canadian lady who has set up an art school for Tibetan youngsters, which offers a rigorous five-year course. Having good relations with the monks, and being expert in some of the religious thangka art – which usually depicts the Buddha – we were able to enter some of the areas normally closed-off to tourists, to see some of the oldest paintings, which quite rightly are protected most of the time. And if you like art, or just helping out a good cause, then visit the Snowland Art School where you can buy art directly from the students, which helps them or helps the school. There is an admirable zero-waste policy – the students pick up discarded tourist trash like Pringles cans, paint them with distinctive Tibetan motifs, and then sell them back to tourists. There are also paintings and other souvenirs. You’ll find the school in an alley near the Nirvana Hotel – a decent mid-range place to stay, with a good restaurant and bar, although it closes quite early. When it’s time to eat, most visitors make a bee-line for the yak dumplings, called momos – sadly for me, Tibetan cuisine is still very meat-based. But you can also get fresh Tibetan bread from small stores near the giant ticket office, or try nice yak’s milk yogurt, or even tea, made with yak butter. Luckily there are also some decent cafes offering coffee and cake, and plenty of other restaurants offering more standard Chinese or Muslim fare. Although you can happily wander around town for a couple of days, you can also take some trips to the nearby grasslands – Sangke or Ganjia. The latter is quite spectacular, and is on the bus route to Xining in neighboring Qinghai Province. Hotels in town can arrange trips, which will include a visit or lunch with a family in a yurt, or you can negotiate with a taxi driver – taxis ply their trade up and down the town, just flag one down, although the ride might not be too comfortable – none seemed to have suspension. Other activities like horse riding are available. But if you do go, go quickly. As I journeyed up the valley I saw signs for a high-speed rail line. 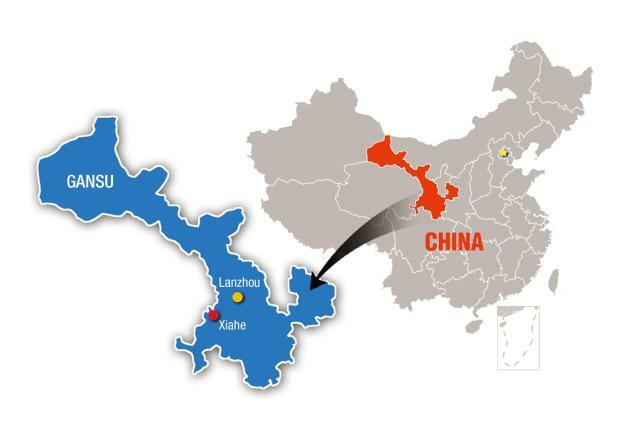 It will link the cities of Lanzhou and Chengdu, and undoubtedly bring much convenience for locals and visitors alike. Whether the small and friendly town can withstand the influx remains to be seen. Getting There There are four direct buses from Lanzhou daily (3 hours), and one direct bus from Xining (around 4.5 hours), as well as connecting services from nearer towns. One way tickets from both destinations cost around 70 yuan. Gannan Xiahe Airport is 70 kilometers from town, and has direct flights to Xi’an, Xining, Yinchuan, Lhasa and Tianjin. You may need to pre-book a taxi as there is no airport bus yet. Taxis in town cost a flat 2 yuan. In winter, many facilities close down, and although it will be cold, the monastery is very picturesque in the snow. Avoid the peak summer months of July and August, as the town is very busy.